Ivan Ilic, a talented concert pianist who is in the top 10 in the world has been appointed as Ulster University Musician in Residence. Tune in at 5pm on Monday 8th October to BBC Radio 3 to hear Ivan Ilic perform on the Programme and of course talk about being the new Musician in Residence at Ulster University. 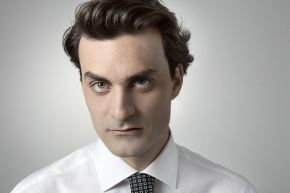 Recently praised by the New Yorker as an "adventurous pianist" who "likes his music on the brainy side," Ivan Ilić is rapidly gaining a strong international reputation. A disciple of the legendary François-René Duchâble, Ivan has earned support from the American Foundation in Paris, the Karic Foundation in Belgrade, the University of Illinois, and the Nadia Boulanger Foundation in Paris. He recently completed a one-year residency at the Cité Internationale des Arts. Ivan started music studies at age 6 and gave his recital debut at 11. He took degrees in music and mathematics at the University of California, Berkeley before moving to Paris on a fellowship from the University. Shortly afterwards Ivan was admitted to the esteemed Conservatoire Supérieur de Paris, where he took a Premier Prix in piano performance. The City of Paris sponsored his first recording. 60 engagements in 2007 included recital débuts in Boston, Washington, Dublin, Bristol, Glasgow, and Cardiff. Current season highlights include recitals at Carnegie Hall (New York), Wigmore Hall (London), the National Concert Hall (Dublin), the Belgrade Philharmonic, and the Glenn Gould Studio (Toronto). Ivan's first CD of music by Claude Debussy, lauded as "masterly" by Gramophone Magazine, recently received Mezzo Television's prestigious M Award in France. The disc is broadcast on BBC Radio 3, Radio 4 Holland, Radio France, Public Radio in America, as well as major classical music stations in Germany, Italy, Spain, Belgium, Estonia, Ireland, the Czech Republic, New Zealand, Australia, Argentina, and South Africa.